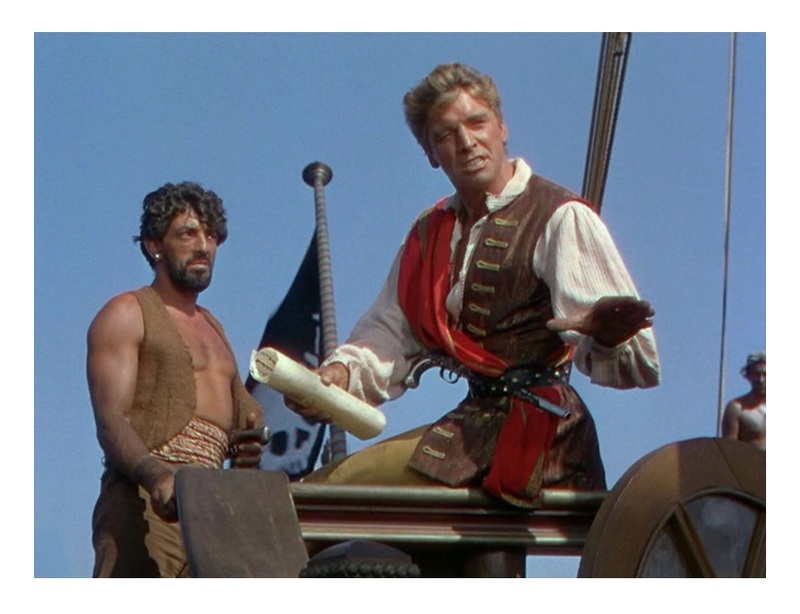 Burt Lancaster (Elmer Gantry) is Captain Vallo, an 18th century pirate known across the high seas as “The Crimson Pirate,” who inadvertently gets involved in an elaborate plan to free a political prisoner. He’s ably assisted by his ever faithful sidekick, Lieutenant Ojo, played by Nick Cravat (The Flame and the Arrow). Splendid action-adventure, a delightfully tongue-in-cheek homage to classic pirate movies. Full of silly jokes, brilliant slapstick, perilous stunts, and romance. In other words, you have to be a total “Scrooge” not enjoy it all. 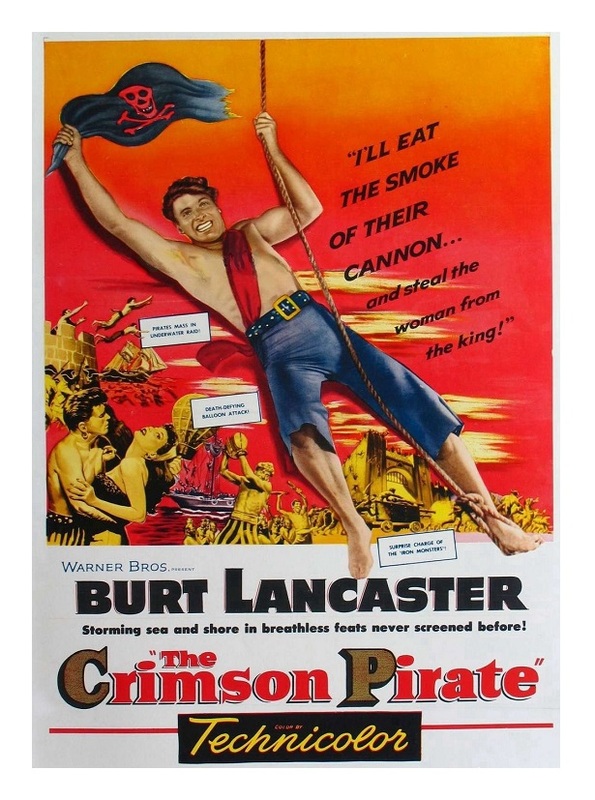 The Crimson Pirate is clearly the inspiration for Disney’s pirate franchise starring Johnny Depp as Captain Jack Sparrow. The original is ultimately unsurpassable in acting, imagination, style, technique, and execution. 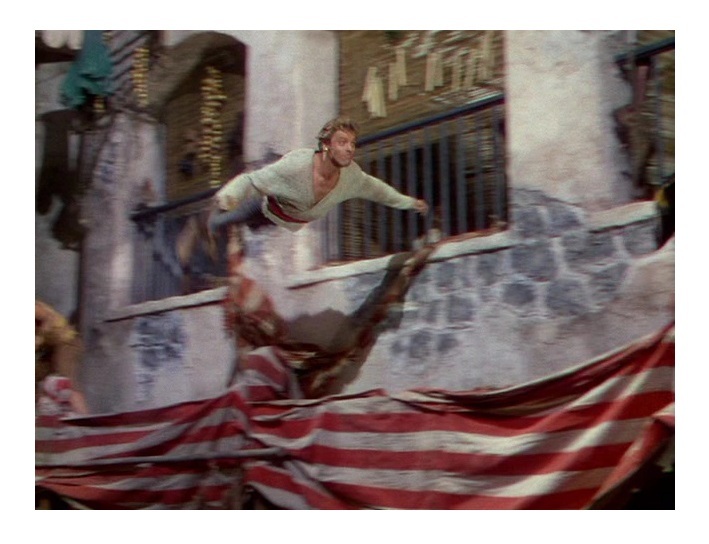 But Lancaster, a former circus acrobat, performed his own stunts alongside his real-life pal Nick Cravat, who was equally adept at wall climbing. Douglas Fairbanks Sr. (The Black Pirate) and Errol Flynn (The Sea Hawk) are the actors mostly associated with swashbuckling adventures, but Lancaster surpasses them all through sheer audacity. The actor’s highly physical performance speaks volumes of his versatility. Who would have thought he could do the things he does here and still go out and do slow-burns like Birdman of Alcatraz and Atlantic City? Still not convinced? The same year The Crimson Pirate was released, Lancaster played a despondent middle-aged alcoholic in Come Back Little Sheba, a character that is everything Captain Vallo is not. That’s pretty impressive! The cast also includes Torin Thatcher (Witness for the Prosecution) as Humble Bellows, Eva Bartok (Madeleine) as Consuelo, and Leslie Bradley (The Conqueror) as Baron Gruda. Christopher Lee (The Lord of the Rings) and Dana Wynter (Airport) have small roles. Interestingly, there is hardly any blue-screen work in the movie, which was filmed on location in Italy. This is an anomaly in the old studio system. The rousing music score is by William Alwyn and Muir Mathieson (This Happy Breed). The vibrant color cinematography is by Otto Heller (Peeping Tom and The Ipcress File). Produced by Lancaster’s production company. The Crimson Pirate has always been a childhood favorite. It’s a classic — one of the best action films of all time, perhaps only rivaled by Raiders of the Lost Ark (1981) and The Road Warrior (1981). It’s also a perfect family film. This is the definition of “fun.” Color, 105 minutes, Not Rated. Such a fun film! When I last saw it I realized that he managed to do all his swashbuckling without ever using a sword. Watching him and Nick Cravat together is almost like watching an acrobatic dance.